Neuropathy is extremely common in diabetic patients, states MayoClinic. Neuracel claims such a condition can be fought off with the right kind of treatment at http://www.neuracel.com. Mayo Clinic, one of the most popular not-for-profit hospitals, has its own expert blog about living with diabetes. The hospital states the problems diabetic patients face if they develop neuropathy and how high blood sugar levels can create complications in their lives on http://goo.gl/V1Qph. Though many people may be unaware of the real implications of neuropathy, any doctor would confirm that symptoms range from extreme pain to no pain at all. This is because the damaged nervous system might paralyze the senses or cause numbness. The nervous system is not the only function of the body that suffers. In certain cases, the heart, digestive system, and other parts of the body are also prone to damage. In situations where medical help is not taken, diabetic patients may have to suffer amputations, paralysis, or may even carry the risk of untimely death. 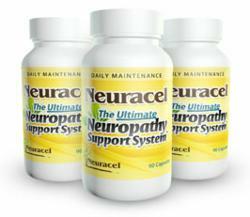 However, a natural remedy for the severe condition is now present and Neuracel has brought about just that with its new Ultimate Neuropathy Support System. Since medical help is stressed in case of diabetic neuropathy, patients should know that they have a lot of options to choose from when it comes to medications and treatments. Over the counter medications are widely available such as drugs or ointments to use on sensitive skin that is prone to injury. Even though diabetic neuropathy cannot be completely cured, its negative effects can be contained and controlled with effective drugs to help improve the lives of those unfortunate enough to develop it. But, much to the dismay of patients, majority of drugs all have side effects. This is where the role of a natural remedy comes in. Neuracel aims to provide the most organic treatments and has done so with its Ultimate Neuropathy Support System, which is made from a combination of 5 herbs. Neuracel guarantees quick results and has been designed to revive the nervous system so that further problems such as paralysis can be avoided. Other symptoms such as pain and tingling can also be completely cured because Neuracel acts as much more than just a pain killer. Those who have not yet heard about this drug can try the trial version which promises a money-back guarantee within a month. The special offer can be found at https://neuracel.com/specialoffer.php. Those looking for evidence of the drug’s effectiveness can read the consumer testimonials at http://www.neuracel.com. Other details and packages can also be found on the website.